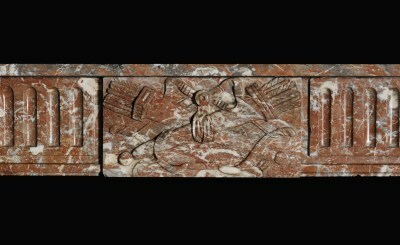 Below the rectangular shelf sits a panelled frieze centered around a carved cartridge, decorated with quivers with arrows and a longbow, tied together by a large ribbon. These are the symbols of Apollo - Greek mithology god of music, healing, archery and prophecy. Apollo’s golden bow and arrows were created by the blacksmith god, Hephaestus, and used by Apollo to kill Python, the dragon offspring of Gaia. 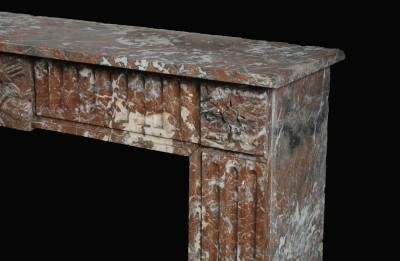 This act enabled Apollo to become god of Prophecy and the Delphi Oracle. 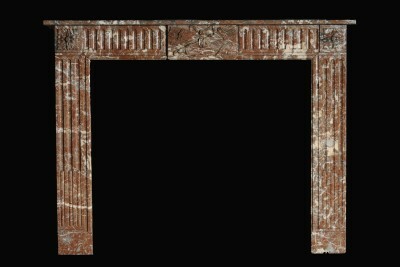 Square floral paterae sit above elaboratly carved fluted jambs.